Founded on 1st January 1994, from the extinct railway companies that existed until the reunification, the main railway company in Germany, Deutsche Bahn AG,was born. With this company, we can travel on regional trains to discover the most beautiful spots, even at high-speed. An affordable and comfortable way to travel around the country. In March 2015, Deutsche Bahn launched a competition to develop a new concept of space, whose aim was to incorporate the customer’s desires according to the different needs for use during a stay in the DB Lounge. Despite the strong competition, CRi were the winners of the competition. 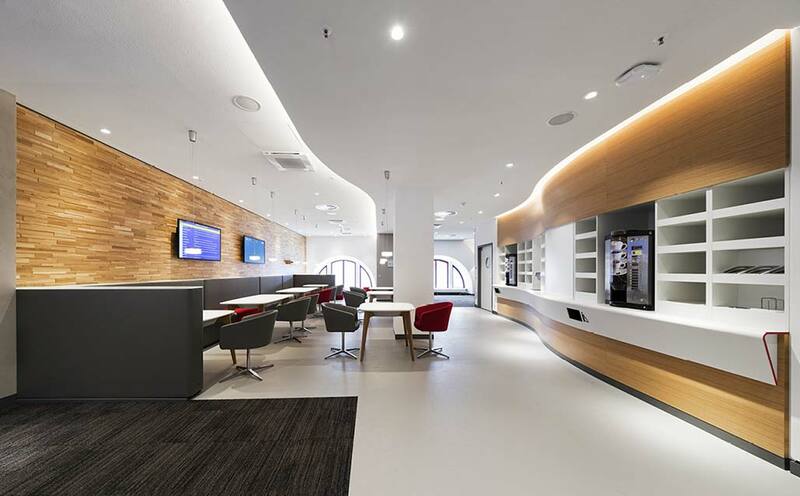 CRi Cronauer and Romani Innenarchitekten GmbH designed a new lounge concept in collaboration with the Deutsche Bahn. The style of the furniture brings us closer to the railway network, each one of the elements evokes a chapter of a journey, that takes us from the winding shape of the bar countertop which imitates a high-speed train, to the S shaped lines of the roof that transport us to the catenary and a bird’s-eye view of the tracks. For these fittings, they counted on the Solid Surface from the PORCELANOSAGroup, KRION. We can find KRION in the catering areas of some of the Deutsche Bahn AG stations, with its conversion into: reception desks, tables, self-service bars, seats… all of them in our colours 6101Frost White and 6401 Red Fire.